BACKGROUND AND PURPOSE: Segmental spinal dysgenesis (SSD) is a rare congenital abnormality in which a segment of the spine and spinal cord fails to develop properly. Our goal was to investigate the neuroradiologic features of this condition in order to correlate our findings with the degree of residual spinal cord function, and to provide insight into the embryologic origin of this disorder. We also aimed to clarify the relationship between SSD and other entities, such as multiple vertebral segmentation defects, congenital vertebral displacement, and caudal regression syndrome (CRS). METHODS: The records of patients treated at our institutions for congenital spinal anomalies were reviewed, and 10 cases were found to satisfy the inclusion criteria for SSD. Plain radiographs were available for review in all cases. MR imaging was performed in eight patients, one of whom also underwent conventional myelography. Two other patients underwent only conventional myelography. RESULTS: Segmental vertebral anomalies involved the thoracolumbar, lumbar, or lumbosacral spine. The spinal cord at the level of the abnormality was thinned or even indiscernible, and a bulky, low-lying cord segment was present caudad to the focal abnormality in most cases. Closed spinal dysraphisms were associated in five cases, and partial sacrococcygeal agenesis in three. Renal anomalies were detected in four cases, and dextrocardia in one; all patients had a neurogenic bladder. CONCLUSION: SSD is an autonomous entity with characteristic clinical and neuroradiologic features; however, SSD and CRS probably represent two faces of a single spectrum of segmental malformations of the spine and spinal cord. The neuroradiologic picture depends on the severity of the malformation and on its segmental level along the longitudinal embryonic axis. The severity of the morphologic derangement correlates with residual spinal cord function and with severity of the clinical deficit. Segmental spinal dysgenesis (SSD) is a rare congenital spinal anomaly characterized by localized agenesis or dysgenesis of the lumbar or thoracolumbar spine, severe congenital kyphosis or kyphoscoliosis, and focal abnormalities of the underlying spinal cord and nerve roots. The malformation is typically segmental; in fact, vertebrae are present both above and below the anomaly and there usually is a lower cord segment within the spinal canal caudally, as if an intermediate segment of the spine and spinal cord were forgotten during embryonic development. To the best of our knowledge, few large studies have been reported since Scott et al (1) recognized SSD as an autonomous entity in 1988. We now present 10 cases of SSD, discussing both their clinical and neuroradiologic features, describing the relationships between SSD and other syndromes (such as multiple vertebral segmentation disorders [MVSD], congenital vertebral displacement [CVD], and caudal regression syndrome [CRS]), and providing insight into the embryologic origin of this complex malformation. The records of patients treated at our institutions between 1975 and 1998 for congenital anomalies of the spine were reviewed. Ten cases were found to satisfy the inclusion criteria for SSD according to the definition of Scott et al (1): segmental agenesis or dysgenesis of the lumbar or thoracolumbar spine, segmental abnormality of the underlying spinal cord and nerve roots, congenital paraplegia or paraparesis, and congenital lower limb deformities. The patients included five boys and five girls aged 1 day to 8 months old at presentation (mean age, 2.7 months). All patients underwent anteroposterior and lateral radiographs of the spine; imaging of the spinal canal was performed by conventional myelography in two cases, by MR imaging in seven cases, and by both methods in one case. These examinations were performed at the time of first presentation to our institutions, at an average age of 3 months (range, 1 day to 8 months). The MR sequence parameters, static magnetic field power, and gradient field strength of the MR imagers varied among cases. All patients were alive at follow-up (average duration, 5.4 years; range, 2 to 14 years). Spinal surgery was performed in seven cases, but the therapeutic approach was heterogeneous owing to the fact that these patients were seen over a 23-year period. Three patients (cases 1, 7, and 8) had arthrodesis of the spine: one (case 8) had a posterior arthrodesis at age 1 year; one (case 7) had two posterior arthrodeses at age 1 year and 2.5 years, respectively; and one (case 1) had a posterior arthrodesis at age 5 years, an anterior arthrodesis at age 5.2 years, and another posterior arthrodesis at age 5.5 years. Four patients (cases 2, 3, 4, and 7) underwent surgical decompression of the spine: one (case 2) had an anterior decompression combined with exeresis of a supernumerary hemivertebra; one (case 3) had a posterior decompression and ligature of neurenteric fistula; one (case 4) had posterior decompression and resection of a tight filum terminale; and one (case 7) had a posterior decompression that was performed simultaneously with posterior arthrodesis at age 1 year. Resection of a tight filum terminale was also performed in a patient with posterior sacral spina bifida (case 5). A summary of our results appears in Tables 1 and 2. Some patients were born at other institutions and were referred to us with a diagnosis of congenital kyphosis. Thoracic or lumbar kyphosis was clinically evident at birth, and a bone spur corresponding to the gibbus apex was palpable on the back in all cases (Fig 1). Three patients had cutaneous stigmata; namely, angiomas (cases 8 and 9), dermal sinus ostium (case 9), and hairy tuft (case 10). None of the patients had open spinal dysraphisms, whereas associated closed (ie, skin-covered) spinal dysraphisms were present in five patients. Case 8: 5-month-old paraplegic boy with SSD. The lower limbs are deformed, there are equinocavovarus feet, and kyphoscoliosis is present with a bony spur along the back (arrow), corresponding to the site of SSD. fig 2. Case 9: 1-month-old girl with SSD and associated partial sacrococcygeal agenesis. A, Lateral radiograph at age 12 months shows marked offset between the two spinal segments above and below the dysgenesis, resulting in marked kyphosis. Only nine thoracic vertebrae and the corresponding pair of ribs are visible; there is complete disconnection of the spine at the level of the dysgenesis, and the lower segment shows a hypoplastic L3 (open arrow) and deformed L4 (solid arrow). Partial sacrococcygeal agenesis is also present, with only S1 through S4 visible. B–E, Sagittal spin-echo (SE) T1-weighted MR images (620/30/4 [TR/TE/excitations]) at age 39 days (B and C) and sagittal fast SE T2-weighted (4000/112/2) (D) and axial fast SE T2-weighted (5000/96/2) (E) MR images at age 24 months confirm the complete disconnection of the spinal segments above and below the dysgenesis. A horseshoe kidney is seen in B and C (asterisk). The upper cord ends at the midthoracic level with a wedge-shaped termination (open arrow, B); a questionable threadlike structure extends below (solid arrow, B). No cord is discernible at the level of the anomaly. Below, the bulky, low-lying lower cord (arrows, C and D) appears to connect with the bottom of a dermal sinus (white arrowhead, B–D). Nerve roots with an aberrant course anteriorly to the lower cord are seen on T2-weighted images (black arrowhead, D). Note worsening of the degree of kyphosis at age 24 months (compare C and D), causing the dermal sinus to collapse. In the axial plane, the bulky lower cord (star, E) and nerve roots are visible coursing anterior to the cord (black arrowheads, E). Posteriorly, the CSF-filled lower spinal canal (asterisk, E) connects with the dermal sinus (arrow, E). Severe motor impairment was present in nine patients, five of whom were paraparetic and four paraplegic; one newborn (case 7) presented with moderately hypertonic lower limbs, although severe paraparesis rapidly ensued. Reduced or absent tendon reflexes were recorded in four patients. Neurogenic bladder with urinary incontinence was found in all patients, and was complicated by uni- or bilateral vesicoureteral reflux in three. Urinary infections with occasional bacteremia were a common complication, and were controlled by medication. All patients had severely hypotrophied and deformed lower limbs, with clonic activity present in four; the hip and knee joints were predominantly held in flexion and extrarotation. Bilateral dislocation of the hips was detected in one patient (case 2). Bilateral equinocavovarus feet were present in all cases. Associated anomalies of other body organs were found in four patients. All of them had renal anomalies: one (case 1) had left crossed ectopia, whereas three (cases 7, 8, and 9) had horseshoe kidneys. Dextrocardia was detected in one patient (case 1). Two children underwent surgery for a tight filum terminale (cases 4 and 5), but no significant improvement in their motor functions was noted afterward. One patient (case 7) had rapid progression of neurologic deficit with ensuing severe paraparesis; despite combined arthrodesis and spinal decompression, this child did not experience any improvement in motor performance. Satisfactory stabilization of the spine was achieved only in one case after three arthrodeses (case 1), whereas in two other patients (cases 7 and 8) further operations are likely to be required. Arthrodeses are also planned in the future for two other children (cases 9 and 10) who have not been surgically treated yet. Moderate to severe kyphosis was present in all cases, and the gibbus apex marked the level of the vertebral malformation. Several types of vertebral abnormalities, such as aplastic or hypoplastic vertebrae, hemivertebrae, and butterfly vertebrae, were present (Figs 2 and 3), so that it was difficult to precisely assess the extent of the abnormal segment; however, the bony malformation involved the lumbar spine in five cases, the thoracolumbar spine in four, and the lumbosacral spine in one. There was either marked stenosis or even interruption of the spinal canal at the level of the malformation; when visible, the spinal canal was superficially located at the gibbus apex. Associated costal abnormalities, such as bifid, fused, or absent ribs, were present in all patients with involvement of the thoracic spine but were absent in the remainder. 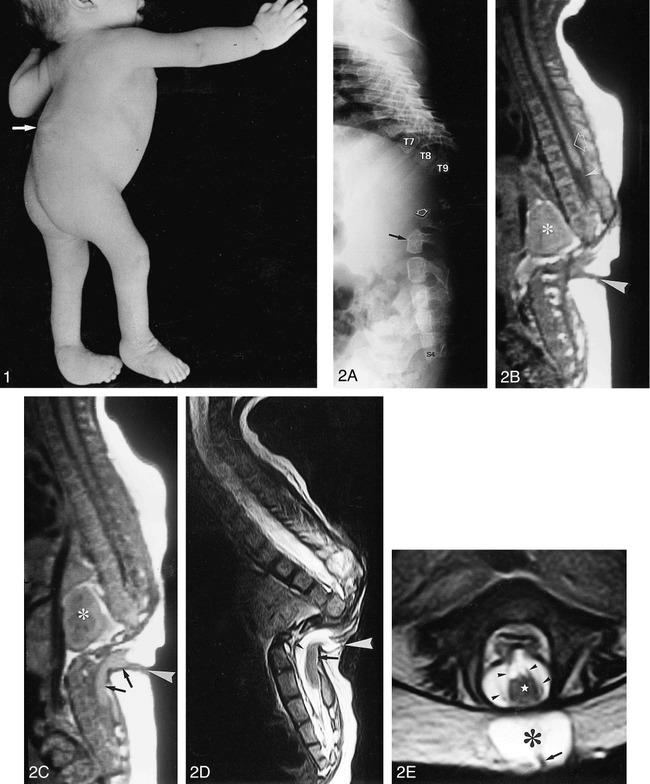 Partial sacrococcygeal agenesis was seen in three patients (cases 1, 3, and 9) (Fig 2). Single-level, localized vertebral abnormalities, such as hemivertebrae, block laminae, and butterfly vertebrae, were detected in other spinal segments in five cases; posterior sacral spina bifida was present in one child. Case 10: 2-month-old girl with SSD and associated questionable coccygeal agenesis. A, Lateral radiograph at age 1 day shows severe hypoplasia and posterior dislocation of L2 (arrow) with absence of posterior vertebral elements. There is marked kyphosis in the upper lumbar spine and questionable absence of the coccyx, as its ossification may be incomplete in the neonate. 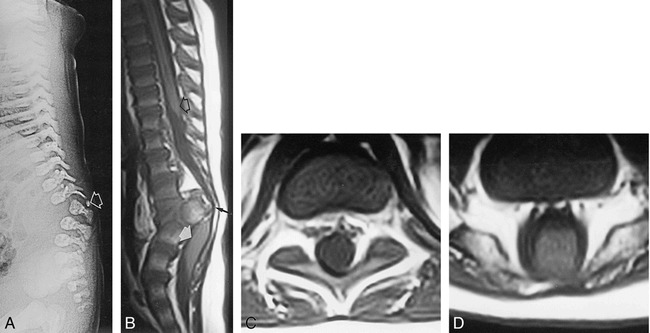 B–D, Sagittal SE (600/20/4) (B) and axial SE (600/16/2) (C and D) T1-weighted MR images at age 12 months show that the upper cord ends at the midthoracic level in a wedge shape (open arrow, B) and contains a thin hydromyelic cavity. Below, no cord is discernible even on the axial images (C and D). At the apex of the kyphosis, the spinal canal is extremely narrowed (black arrow, B). Below, a bulky, low-lying lower cord is visible in the thecal sac (white arrow, B) and appears to fill it almost completely (D). The spinal cord was morphologically abnormal in all cases. At the level of the gibbus, the cord was abnormally thin in six patients (Figs 4 and 5), whereas it was altogether indiscernible in the remainder (Figs 2 and 3). In the latter group, the spinal cord was apparently interrupted at some vertebral levels above the gibbus apex (Figs 2 and 3). A bulky, thickened lower cord segment was detected caudally in eight patients, whereas in one child (case 3) conventional myelography detected a rounded mass at the L4–L5 level, and histology revealed a hamartomatous conglomeration of gray and white matter, possibly representing a rudiment of the conus apex; in another patient with lumbosacral SSD (Fig 5), the hypoplastic cord segment blended with the filum terminale, which was tethered to the sacrum. The tip of the conus medullaris was located at or below L3 in all cases. A and B, Sagittal SE T1-weighted MR image (500/14/2) (A) and 3-mm-thick reformatted sagittal MR image obtained from a 3D gradient-echo sequence (20/7/1) with 30° flip angle (80 original 1-mm-thick partitions) (B) at age 9 years. In this case the malformation involves the upper lumbar segment. The degree of kyphosis is moderate, and there is no disconnection of the spinal canal. The upper cord (open arrow, A) is continuous with a hypoplastic cord segment (arrowheads, A). Below, the lower cord (solid arrow, A) is bulky and low-lying. The abrupt change in caliber of the spinal cord may be seen more easily on the reformatted image (arrowheads, B). fig 5. Case 5: 5-month-old boy with SSD involving the lumbosacral spine. Sagittal SE T1-weighted (600/20/4) MR image at age 2 years shows marked kyphosis in the lumbosacral spine with absent or undetermined vertebrae. The spinal cord is hypoplastic and blends with the filum terminale, surrounding the dysgenetic vertebral bodies and apparently tethering to the sacrum (arrowheads). Because the dysgenesis involves the lowermost portion of the neural plate, there cannot be a lower cord segment; in fact, this particular case illustrates an overlap between SSD and CRS. There is concurrent hydromyelia in the thoracic spinal cord (arrows). Closed spinal dysraphisms were associated in five patients. In one patient (case 9), the lower cord was connected to the bottom of a dermal sinus (Fig 2). Diastematomyelia without a septum was detected in one case. The hypoplastic cord segment was tethered to the abnormal vertebrae by a small intradural lipoma in one case. A neurenteric fistula with leakage of contrast material in the retroperitoneum was detected by conventional myelography in one case. The lower cord was tethered to the sacrum by a tight filum terminale in two cases (Fig 5). Hydromyelia was detected in the upper cord in two cases (Figs 3 and 5). SSD is characterized by localized deformity of the thoracolumbar, lumbar, or lumbosacral spine associated with abnormal development of the underlying spinal cord and nerve roots (1). The neuroradiologic picture is variable according to the extent and level of the abnormality, the degree of resulting kyphosis, and the presence of associated abnormalities, such as closed spinal dysraphisms. It is often difficult to precisely assess the extent of the anomalous segment because of the presence of indeterminate, aplastic, hypoplastic, or incompletely segmented vertebrae (1). The focal bony malformation results in congenital acute-angle kyphosis or kyphoscoliosis that is usually visible at birth (Fig 1), and the spinal canal is severely narrowed or even interrupted at the gibbus apex (1, 2). Although conventional myelography and CT myelography were used in the past to assess the contents of the spinal canal (1), MR imaging reliably detects spinal cord abnormalities and should always be performed at presentation. Characteristically, there is a normal upper spinal cord, a markedly abnormal (either thinned or even indiscernible) cord segment devoid of nerve roots (3, 4), and a bulky, thickened, and low-lying lower cord caudally. There appears to be a continuous spectrum of variability in the neuroradiologic picture of SSD. In some patients with less severe kyphosis, there is a more or less markedly thinned cord and the spinal canal is continuous through the defect (Figs 4 and 5). The change in caliber of the spinal cord is abrupt, resulting in a wedge shape (Fig 4) that strongly suggests a dysraphic abnormality with segmental hypoplasia of the spinal cord. In other cases, there is acute-angle kyphosis or kyphoscoliosis associated with an indiscernible spinal cord at the gibbus apex (Figs 2 and 3); in these cases, the abnormal cord segment could be either extremely hypoplastic (to the extent that it cannot be detected even on thin-section MR images) or absent altogether. There usually is marked rotational offset between the spinal segments above and below the malformation, to the extent that a complete disconnection of the spine exists in the most severe cases. This picture could explain the apparent “doubling” of the spinal canal in the axial plane described by McKay and Nason (5), which could result from a sort of CT artifact (Dias MS, personal communication). As previously stated, the lower cord is almost invariably bulky and low-lying (Figs 2–4⇑⇑). The presence of a cord segment within the caudal spinal canal is a dominant and unique feature of SSD. However, when the lumbosacral spine is involved, the level of the segmental anomaly is too caudal for a spinal cord segment to develop below; in these cases, there will be no lower cord caudad to the hypoplastic cord segment (Fig 5) (see “Embryologic Correlation” below). To the best of our knowledge, open spinal dysraphisms have never been described in patients with SSD, and did not occur in our cases; however, several forms of closed spinal dysraphisms do occur, such as the full-blown split notochord syndrome, diastematomyelia, dermal sinus (6), terminal myelocystocele (7), lipomas, thickened filum terminale, and sacral spina bifida (1). Our results indicate that the association between SSD and closed spinal dysraphisms is more frequent than was previously reported (1), and that the dysraphic state itself may involve the cord above, at, or below the level of the segmental anomaly. Careful examination and monitoring of the neurologic status is mandatory in small babies with SSD. There usually is moderate to severe motor impairment, and affected newborns can be paraplegic at presentation. Associated deformities of the lower limbs are common, and are mainly represented by flexion-abduction of the hip joints, flexion of the knees, and equinocavovarus feet, which in the most severe forms result in a sitting position described as “Buddha-like” (8). These deformities probably depend both on the level of paraplegia and on a primary anomaly of muscular attachment, and often require multistep surgical correction. Five of six patients with segmentally hypoplastic cord were more or less severely paraparetic, and three of four patients with segmentally indiscernible cord were paraplegic at presentation; however, one newborn with hypoplastic cord was paraplegic, whereas one patient with an indiscernible cord had mildly hypertonic lower limbs at presentation, although severe paraparesis developed subsequently. Therefore, the degree of neurologic deficit appears to depend not only on how hypoplastic but also on how functioning the residual spinal cord is. As a consequence, there appears to be a continuum ranging from moderate hypoplasia to absence of the spinal cord, with the clinical picture depending on the degree of residual function of the malformed spinal cord. Additionally, renal abnormalities, such as horseshoe kidneys and renal ectopia, have also been described (1). We found such anomalies in four patients. Moreover, neurogenic bladder is consistently present, and may be complicated by urinary infections, vesicoureteral reflux, and hydronephrosis. These conditions may cause significant morbidity and usually affect heavily the quality of life of these patients; therefore, associated abnormalities should actively be sought in all babies with SSD. Although sonography remains the first-choice examination in the evaluation of the kidneys and urinary system, a thin-section MR study of the entire spine in all three projections using T1-weighted images may be indicated to look for associated urinary anomalies. Even though patients with SSD are not necessarily paraplegic at presentation (2, 9, 10), they are at increased risk for the development of neurologic deficits owing to the instability and congenital stenosis of the spine, aggravated by the frequent presence of closed spinal dysraphism (2, 11). These considerations raise the question of what would be the optimal treatment of these children and how MR imaging may affect the surgical strategy. The role of spinal decompression is unclear because the neurologic deficit seems to be related to the congenital hypoplasia or absence of an entire segment of the spinal cord (1). Decompression is unlikely to provide significant improvement in patients with congenital paraplegia. However, MR imaging may be useful in identifying those children with incomplete spinal cord deficit who may benefit from decompression surgery by depicting severe spinal canal stenosis or hyperintensity of the spinal cord on T2-weighted images as an expression of superimposed spinal cord damage due to progressing kyphoscoliosis. Additionally, MR imaging may detect causes of spinal cord tethering (ie, tight filum terminale) that may require surgery to prevent progression of kyphoscoliosis and spinal instability. There is considerable debate in the literature about the optimal timing for performing arthrodesis. While some authors (2, 12) recommend that arthrodesis be performed as soon as the diagnosis has been made, it may be extremely difficult to achieve solid fusion, and several procedures may be required, mainly because of the immaturity of the osseous bed in the newborn. Because stabilizing surgery is essentially performed to enable the patient to sit up without support, our strategy is to initially refrain from surgery unless conservative measures, such as bracing, fail to halt the progression of neurologic deficit. Although arthrodesis may be proposed at age 5 to 6 months (ie, when the sitting posture develops) (1), it is our current policy to protract the use of bracing to at least age 2 to 3 years, when the maturation and growth of the osseous bed may significantly increase the chances of success of stabilizing surgery. However, we agree with Scott et al (1) in that the management of the orthopedic deformity in these children is complicated and must be individualized. To summarize, we found a correlation between the degree of motor impairment and the caliber of the spinal cord at the level of the dysgenesis. However, the clinical classification of SSD appears to depend not only on the neuroradiologic picture but also on the degree of residual function. In 1938, Jarcho and Levin (13) described two siblings with multiple segmentation defects of the vertebral column and fusion of several ribs. Several types of MVSD, characterized by short-trunk dwarfism and variably associated with costal abnormalities, have since been gathered under the collective term Jarcho-Levin syndrome; however, there is still considerable semantic and nosologic confusion in the literature. Mortier et al (14) categorized MVSD into three distinct types: Jarcho-Levin syndrome proper, spondylothoracic dysostosis, and spondylocostal dysostosis. Jarcho-Levin syndrome has autosomal recessive inheritance, and affected infants usually die before age 2 years from respiratory infections; it is radiologically characterized by a symmetric crablike thorax (15) and vertebral segmentation defects, usually involving the entire spine. Spondylothoracic dysostosis has autosomal recessive inheritance, and early infantile death from lethal respiratory infections is common. Radiologically, vertebral defects usually involve the entire spine, with predominance in the thoracic spine, and anomalous ribs may be present (16). Spondylocostal dysostosis is inherited in an autosomal dominant mode, and affected patients have a normal life span; radiologically, it is characterized by severe kyphoscoliosis, milder vertebral segmentation anomalies, and the invariable presence of abnormal ribs. Associated neural tube defects have been reported in several patients with MVSD (16, 17); however, little, if any, attention has been paid so far to the morphology of the spinal cord, probably because neurologic impairment is not a principal feature with these disorders. We were able to identify several clinical and neuroradiologic features that appear to be typical of SSD and distinctly uncommon with MVSD: a) the disorder is sporadic; b) affected patients have a normal life span (2), and life-threatening infantile respiratory diseases are uncommon; c) neurologic impairment is the rule, although some newborns may be neurologically intact at presentation; d) the vertebral malformation is typically localized in a determined spinal segment, usually in the thoracolumbar or upper lumbar spine, although minor vertebral anomalies may involve other spinal levels; e) not surprisingly, abnormal ribs may be associated when the malformation involves the thoracic spine, because the ribs develop from ventrolateral migration of cells from the thoracic sclerotomes (18); and f) most important, the spinal cord is segmentally abnormal. We conclude that SSD is a separate entity from MVSD, with the main differential feature being the typically segmental malformation of the spine and spinal cord. CVD is defined as dislocation at a single vertebral level that results in an abrupt offset of the spinal canal; two patterns of deformity may be identified according to the presence of single-plane or multiple-plane offset (19). Neurologic deficits can be amazingly mild; when present, they result from marked spinal instability combined with compression of the spinal cord. Closed spinal dysraphisms are typically not associated. CVD is a single-level spinal abnormality, and the vertebral pedicles are consistently present in CVD and absent in SSD (Dias MS, personal communication). The spinal cord is stretched or compressed in CVD, but is otherwise normally developed (see Fig 2A in ), whereas it is segmentally abnormal in SSD. Therefore, we conclude that CVD is a disorder different from SSD because it is a single-level deformity, the vertebral abnormality does not involve the posterior neural arch, and the spinal cord is stretched or compressed, but not segmentally malformed. In 1992, Carstens et al (20) described six infants with an isolated absence of spinal segments, mainly involving the lower thoracic and lumbar regions. All patients had congenital kyphoscoliosis and complete paraplegia, usually at a level that corresponded to the bony aplasia. MR imaging was performed in one patient, and showed absent spinal cord at the level of the aplasia with intraspinal neural structures distally. These authors believed they were dealing with a new syndrome, and named it “medial spinal aplasia” (20). However, their description of clinical and radiologic findings coincides with severe SSD; we therefore suggest that this entity probably represents the most severe end of the SSD spectrum, and discourage the use of the term medial spinal aplasia. Faciszewski et al (2) raised the problem of the relationship between SSD and CRS, and made clear that they excluded from their definition of SSD all cases in which a segmental defect in the thoracolumbar or lumbar region was associated with caudal spinal anomalies. However, they provided no embryologic reasons for their doing so and, moreover, accepted that two separate segmental levels of dysgenesis could be found in the same patient. We see little, if any, difference between this concept and the association of SSD with caudal spinal anomalies, such as coccygeal or sacrococcygeal agenesis. We saw three cases of SSD associated with partial sacrococcygeal agenesis, whereas renal abnormalities, such as crossed ectopia and horseshoe kidneys, were present in four cases. The coexistence of some features of CRS in typical cases of SSD probably reflects a form of multisegmental early embryonic chorda-mesodermal derangement (see “Embryologic Correlation” below). We speculate that if such derangement involves an intermediate segment along the longitudinal embryonic axis, SSD results; if it involves the most caudal segment, CRS results. If two segments are involved, double levels of SSD, or the association between SSD and sacrococcygeal agenesis, may be explained. To cite but one reported case, the association between anencephaly and sirenomelia, described by Rodriguez et al in 1991 (21), is another confirmation of the theory that multiple midline, segmental chorda-mesodermal derangements may be found in association, and that the clinical and neuroradiologic picture essentially depends on what segments of the developing embryo are involved. We conclude that SSD and CRS probably represent two faces of a single spectrum of segmental malformations of the spine and spinal cord, only differing, from an embryologic point of view, in the segmental location of the derangement along the longitudinal axis of the embryo. However, although these entities are probably embryologically related, major differences exist both in terms of clinical expression and neuroradiologic features; moreover, one of the most compelling reasons to separate SSD from CRS or other forms of dysraphism is that SSD is unlikely to benefit significantly from untethering procedures, since the neurologic disturbance seems to be related to the congenital hypoplasia or absence of roots or an entire segment of the spinal cord, rather than to cord tethering (1). Dias et al (22) suggested that complex dysraphic malformations with associated complex vertebral and systemic anomalies may represent a disorder of gastrulation; namely, the process by which the bilaminar embryonic disk is converted into a trilaminar disk, corresponding to the third gestational week (23) (Fig 6). Human gastrulation begins by day 14 or 15, when ectodermal cells start migrating toward the primitive streak, pass inward at the primitive pit to the interface of ectoderm and endoderm, and then migrate laterally along the interface to form the interposed mesoderm. Such migration occurs along defined routes to each side of the midline, but no mesodermal cells migrate along the midline between the primitive streak and the prochordal plate; these paired mesodermal anlagen subsequently integrate along the midline to form the notochordal process (18). Dias et al (22) showed that in complex dysraphic malformations the paired mesodermal anlagen remain separate and develop independently over variable portions of their length. Such a mechanism accounts for several varieties of dysraphic states, including the full-blown split notochord syndrome, diastematomyelia, dermal sinus tracts, and caudal agenesis. The presence of elements of the split notochord syndrome in three patients in our series and of partial sacrococcygeal agenesis in another three suggests a strict timing correlation with SSD; in particular, the presence of a neurenteric fistula (embryologically related to the persistence of the neurenteric canal) is strongly suggestive, because the neurenteric canal is a transient embryonic communication between the amniotic and yolk sacs through the primitive pit, which normally exists only for approximately 48 hours during the third gestational week before becoming obliterated (22) (Fig 7). Prompted by these initial considerations, we aimed to conceive a tenable embryogenetic theory to explain the pathologic and neuroradiologic features of SSD on the basis of deranged gastrulation. For expositive purposes, we will consider separately the dysgenetic segment proper and the spine and spinal cord caudad to the level of SSD. A, Normal human gastrulation. Prospective endodermal and mesodermal cells of the epiblast migrate toward the midline and ingress (arrows) through defects in the basement membrane at the primitive streak to become definitive endoderm and mesoderm. B, Normal human gastrulation. 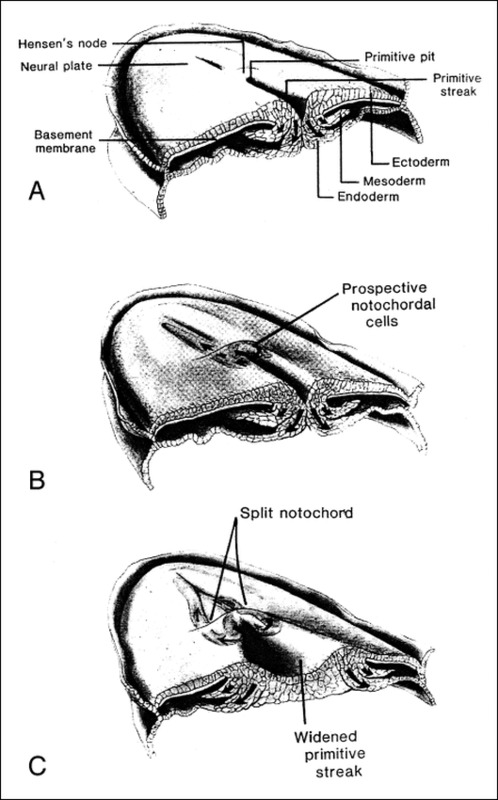 Prospective notochordal cells located along the anterior margin of Hensen's node ingress through the primitive pit to become the notochordal process located between the ectoderm and endoderm. C, Abnormal gastrulation resulting in a failure of midline axial integration. The primitive streak is abnormally wide; prospective notochordal cells therefore begin ingression more laterally than normal. As a result, two notochordal processes are formed. The caudal neuroepithelium, comprising two columns of tissue that flank and are separated by the primitive streak, fails to become integrated to form a single neuroepithelial sheet and instead forms two hemineural plates. The type of resultant malformation depends on the level and extent of the abnormality, and the success of subsequent reparative efforts. Reproduced from (22) with permission of S. Karger AG, Basel, Switzerland. Notochordal canalization, intercalation and excalation. A, The notochordal process contains a central lumen (the notochordal canal), which is continuous with the amniotic cavity through the primitive pit. B, During intercalation, the canalized notochordal process fuses with the underlying endoderm; the communication of the amnion with the yolk sac forms the primitive neurenteric canal. 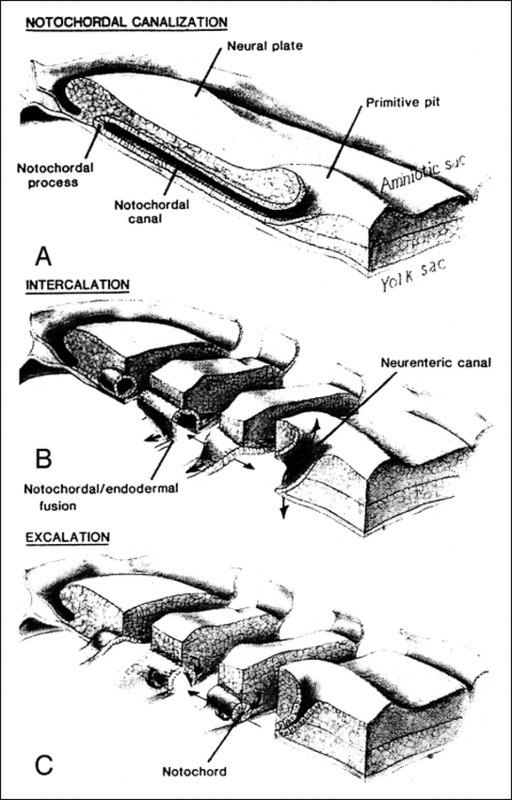 C, During excalation, the notochord rolls up and separates from the endoderm to become the definitive notochord; the primitive neurenteric canal becomes obliterated. Reproduced from (22) with permission of S. Karger AG, Basel, Switzerland. The induction and development of the somites will be altered. Normally, 42 to 44 pairs of somites are formed (18); each somite differentiates in a dermatome (future skin), a myotome (future muscles), and a sclerotome (future cartilage, bone, and ligament of the spinal column). Histologic studies on avian embryos have proved that the removal of a notochordal segment causes massive death of sclerotomal cells, whereas the myotome and dermatome are essentially unaffected (26). A wide array of segmental vertebral malformations, including segmentation defects, indeterminate or block vertebrae, or even absence of several vertebrae, results from segmental chorda-mesodermal derangement; abnormal ribs will also be found if the thoracic spine is involved, owing to their common embryologic origin (18). Moreover, because the dermatome survives regardless of the state of sclerotome differentiation (26), the consistent absence of open spinal dysraphism in cases of SSD may also be explained. Because the chorda-mesoderm, probably together with the underlying endoderm (22), acts as a neural inducer, at the beginning of primary neurulation there already exists an established anomaly in which fewer prospective neuroectodermal cells, or even no cells at all, are induced to form the neural plate in the pathologic segment. In milder cases, neurulation of a depauperated neural plate results in a hypoplastic cord segment; conversely, no neurulation occurs in the most severe cases, so that no cord is formed. In a study on chick embryos, van Straaten et al (27) proved that the extirpation of a notochordal fragment at 1.5 days of incubation resulted in a segmental abnormality characterized by smaller than normal or even unrecognizable somites and severe reduction in spinal cord size; caudal to this site, a normal morphology of the spine and spinal cord gradually reappeared. In other words, these authors were able to obtain an experimental model of SSD in chick embryos as a result of segmental notochordal damage. Because of the metameric relationship between each vertebra and the corresponding spinal cord level, the hypoplastic or absent cord segment begins cephalad to the bony dysgenesis. Nerve roots are missing in the abnormal segment, possibly as a result of apoptotic elimination of somatic motoneurons (28). This hypothesis was confirmed by prior studies in vitamin A–deficient quail embryos, in which the neural tube failed to extend neurites into the periphery and the neural crest cells throughout the embryo died by apoptosis (29). The localized, segmental cord abnormality does not prevent neurulation from occurring in the segments of the neural plate caudad to the malformation, resulting in the presence of a lower cord segment in the vast majority of cases. Van Allen et al (30) suggested that the neural tube, rather than closing in a zipperlike fashion, as is commonly believed, undergoes neurulation starting from five independent closure sites. If eventually proved true, this hypothesis might add substance to the embryogenetic understanding of SSD. In fact, these authors state that closure 1 of the neural tube forms the spinal cord down to L2, whereas closure 5 is initiated at S2 and proceeds rostrally to meet the caudal closure 1 at L2; therefore, the interface between closures 1 and 5 would be a sort of watershed area, explaining the comparatively higher prevalence of neural tube defects in this region than in other spinal segments (30). We surmise that the presence of multiple sites of neural tube closure might reflect regional differences in chorda-mesodermal induction of the neural plate. The high prevalence of SSD in the thoracolumbar and upper lumbar spine, namely, right at the interface between closures 1 and 5, could be explained by an intrinsic weakness, either genetically imprinted or teratogen-induced, of this area as compared with other notochordal segments. However, this speculation remains to be proved embryologically. Other considerations regarding the presence of lower cord segments in most cases of SSD deserve mention. First, because this lower segment is invariably low-lying, postneurulation ischemic damage (4, 31) seems unlikely; rather, a malformative cause is strongly suggested. In fact, it should be stressed that spinal MR images in the term newborn show a 9-month-old spinal cord, whose metameric relationship with the spinal column is determined by the different growth rate between the cord and the column (32); the consistently low position of the lower cord segment in SSD probably reflects the original location of the caudal neuroectoderm as a result of impaired, or even absent, relative ascent of the spinal cord through the dysgenesis. Second, the lower cord segment is invariably bulky and thickened. As a possible explanation, it should first be considered that the elongation of the notochord occurs primarily by the addition of cells to its caudal end rather than by cranial extension of the notochordal process (22, 23). If, during gastrulation, a derangement occurs at a given segmental level, subsequent migrating waves of prospective chorda-mesodermal cells will be dammed below the malformed segment. However, as these cells are not wrongly specified in terms of their eventual location, they will not die by positional apoptosis; rather, they will induce an increased amount of cells to form the lower lumbar neuroectoderm, so that a thicker lower cord segment eventually results. Finally, the neuroradiologic picture appears to depend not only on the degree of depletion of the chorda-mesoderm and, consequently, on the degree of prospective neuroectoderm in the dysgenetic segment but also on the level of the segmental damage along the longitudinal axis of the embryo. In fact, in order to have a lower cord segment it is necessary that a segment of normal neural plate exist below the segmental abnormality. This occurs in all cases of thoracolumbar or upper lumbar SSD (Figs 2–4⇑⇑), in which the future interface between closures 1 and 5 of the neural tube (30) is involved. However, the lowermost end of the neural plate lies at the level of S2 (32, 33); below that, caudal nervous structures (the tip of the conus medullaris and the filum terminale) are formed by the process of secondary neurulation and retrogressive differentiation. Therefore, it only seems logical to expect that if the malformation involves the upper sacrum, corresponding to the interface between closure 5 and the caudal cell mass, no lower cord segment can possibly exist caudally; rather, the hypoplastic cord segment will blend with the filum terminale (Fig 5). 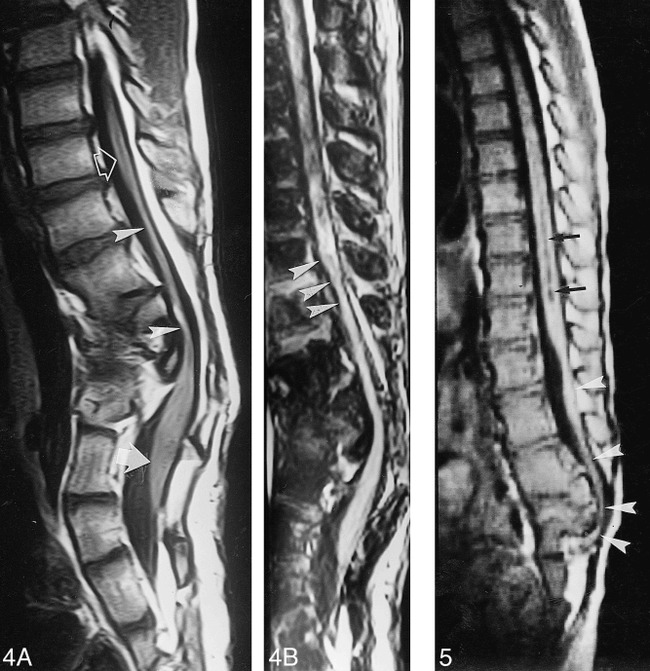 When the segmental level of the abnormality is low and associated caudal spinal abnormalities such as partial sacrococcygeal agenesis occur, derangements of secondary neurulation are expected to accompany SSD; consequently, apparently bizarre phenotypes, such as the presence of aberrant remnants of the conus tip continuous with the hypoplastic cord, may be explained. To summarize, we believe there is sufficient evidence to surmise that the causal insult in SSD results from chorda-mesodermal derangement during gastrulation, possibly related to positional apoptosis of cells with wrong axial specification, whereas other theories dating the damage to subsequent developmental stages seem less tenable. The eventual malformative picture appears to correlate with two main factors: the severity of the abnormality and the segmental level at which it occurs. Rather than a single entity, SSD should be perceived as a morphologic continuum ranging from hypoplasia of the spinal cord and continuity of the spine throughout the anomaly on one end to absence of the spinal cord and interruption of the spine on the other. The spinal cord malformation could depend on the degree of depletion of the neural plate resulting from early embryonic chorda-mesodermal derangement. The causal event probably occurs during gastrulation and may be related to a genetically induced alteration in the process of embryonic axial patterning with elimination of wrongly specified cells by positional apoptosis. The neuroradiologic picture essentially depends on two variables: 1) the severity of the damage and consequent neuroectodermal depletion and 2) the level of the segmental dysgenesis along the longitudinal axis of the embryo. A third variable, the residual function of the malformed cord segment, correlates the morphologic abnormality to the severity of the clinical deficit. However, associated anomalies, such as neurogenic bladder and renal abnormalities, may often cause the greatest morbidity; they should therefore be recognized by the surgeon who is undertaking surgical repair. ↵1 Address reprint requests to Paolo Tortori-Donati, MD, Department of Pediatric Neuroradiology, “G. Gaslini” Children's Research Hospital, Largo G. Gaslini 5, I-16148 Genoa, Italy.